It was a difficult week. The date has been set. The votes have been counted. The deportations will likely begin in January. On June 28th, the Government of Canada signed into law Bill C-31, the so-called Protecting Canada’s Immigration System Act. Under the guise of reforming unfair queue jumping and eliminating what Canadian Immigration Minister Jason Kenny has termed “bogus refugees,” this new legislation will streamline the current application process, moving away from a reliance upon panels of human rights experts, and concentrating more power in the hands of the Minster. There are some places in our world so evil, that the very ground you walk upon can drain you of hope. Places where cruelty is the norm, where persons are transformed into numbers, and where good people say nothing. 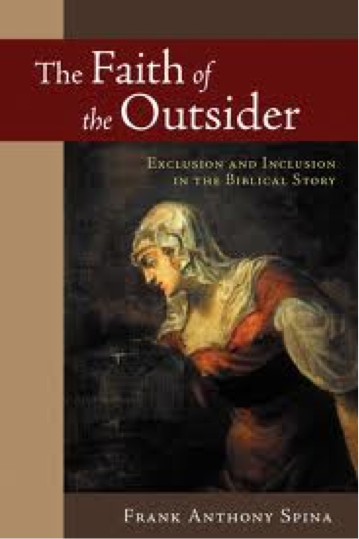 A review of Frank Anthony Spina’s The Faith of the Outsider: Exclusion and Inclusion in the Biblical Story, Grand Rapids: Wm. B. Erdmans Publishing Co., 2005, 206 pages. Immigration lawyer Mitchell Goldberg speaks out against Bill C-31 on the steps of Quebec City’s Anglican cathedral. Photo courtesy of Bruce Myers. In March I wrote an article for The Tyee called “Occupy the Pews,” exploring the idea of prophetic ministry. That’s when members of a church apply Christian teachings to the world around them, which often means confronting uncomfortable contradictions, speaking truth, and challenging power. Effective prophets, like Jesus of Nazareth, tend to have short careers. I argued that with its clear values and existing infrastructure, the Anglican Church of Canada should be a powerful organ of progressive social change. Yet this impulse is often stymied by the practicalities of institutional survival. The Church struggles constantly to reconcile its spiritual calling with real-world politics and economics.